Total Weight Loss/Gain: As of last week, I've gained 22 lb so far. I'm sure I'm up to at least 25 by now, I've gained more in the last few weeks than in the first 2 trimesters combined. Maternity Clothes: All the time! A few things that fit well earlier on are getting tight. Stretch marks: Still none, but I'm starting to get a linea negra! Sleep: So - so. I get about 7-8 hrs a night, but it's hit or miss. I can only sleep on my left at this point. If I sleep on my right, I get the rib pain which has been the bane of my existence for the last 2 months. Movement: All I can say is "oof!" I'm really getting some strong jabs at this point, as he runs out of room. Cravings/Aversions: I've been eating more lately, especially since the heartburn has gotten under control via Zantac 2x a day. Lots of pasta and rice. Symptoms: Not to complain, but I'm getting into the "dog days"! More back and rib pain. I can't sit comfortably in any chair, no matter how comfy, for more than about 20 minutes. Long drives are starting to really get hard (and I drive frequently for work between 3 offices in 3 counties). I have frequent BH contractions, especially when I go from sitting to standing. It's getting harder to bend or crouch down. On the positive side, the heartburn is well controlled and my hair is so thick and luxurious! I will miss it when it inevitably falls out! What I miss: Being able to sit comfortably! 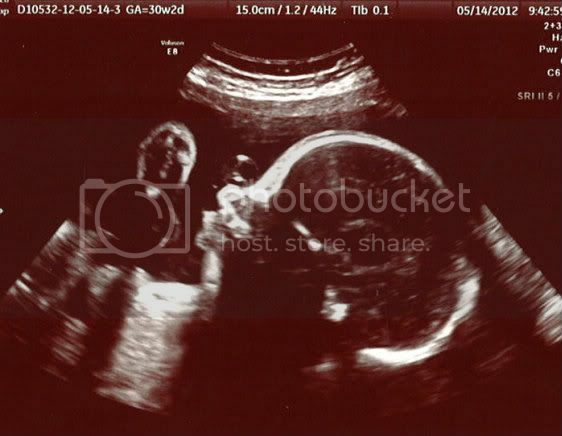 What I look forward to: The next ultrasound (which is Friday June 8) so I can see what's going on with the baby's cord. We'll probably get a better idea about bedrest / c-section at that time. Moods: Also so-so. Trying to be cheerful as possible but getting a little snippy at work! Milestones: None this week, but every week that goes by he's more ready to be born! Medical concerns: Just the issue with the cord placement, we'll see about that on June 8. Misc: My shower is in 3 weeks and can't come soon enough. I'm feeling pretty nest-y and not very prepared for his arrival. We did just get his crib and dresser, but no mattress or sheets yet. We have very few clothes, a few hand me down diapers, his carseat and stroller, that's about it! Still can't quite wrap my head around the fact that we'll (God willing) have our baby at home in about 8 weeks. Just a quickie this time. I had an ultrasound today to check on the location of the placenta. It's a good news / bad news situation. The good news is that the baby looks great and placenta has moved away from the cervix, so no more placenta previa. The bad news is that the cord is attached on the side of the placenta closest to the cervix and is therefore in between the baby's head and the cervix. (He's not fully head down yet, his head is at about 5'oclock if you were facing me.) If the cord doesn't move out of the way, I'll have to have a C-section because of the risk of umbilical prolapse (aka cord coming out before baby) There's still 10 weeks for it to resolve and I'm hoping it resolves itself because I really don't want to have a C-section. But, there's nothing I can do about it, so I'll just have to wait and see. It was nice to see the baby and how he has grown since the last ultrasound 6 weeks ago. He's weighing in at around 3.5 lbs. They didn't do a 3D but I got some good profile pics - click here and here to see them. There was some very sad news yesterday in the infertility blogosphere. One of my very favorite bloggers, Jennepper, lost her sweet Ainsley a few days ago. She and her family have been on my mind all day and I can't even imagine what they are going through, especially after already losing Ainsley's identical twin. My thoughts and prayers go out to the Knepper family. I passed the 3-hour test. Hooray - no GD! I failed the 1-hour glucose test! The 3-hour is Wednesday. I can't believe I'm 28 weeks and in the 3rd trimester! Where did the time go? Time for a long-overdue update. Total Weight Loss/Gain: As of yesterday, I have gained 19 lbs so far. After a pretty slow start, I'm starting to gain in earnest! I gained 4 lb since my last doc appt 2 weeks ago. Maternity Clothes: I have 2 pre-pregnancy tops I can still wear, other than that all maternity clothes. Some of the clothes are getting tight (especially pants) and the full-panel pants are getting more and more uncomfortable. Sleep: Pretty good lately, getting up 1-2x a night to use the bathroom, but I can get right back to sleep. Movement: Lots of movement every day. Since yesterday, I have started feeling (I think) his actual knees or elbows as he shifts from one position to another. He's definitely growing and kicking stronger, though I don't know what position he is in. I'll find out at my ultrasound on May 14. Cravings/Aversions: Not much of an appetite these days, mostly because the heartburn is killing me. I have been taking Zan.tac 150 daily and eating Tums like candy, the doc gave me the OK to take the Zantac 2x a day. What I miss: Being able to move around, bend over, crouch down easily and sit on the sofa comfortably. 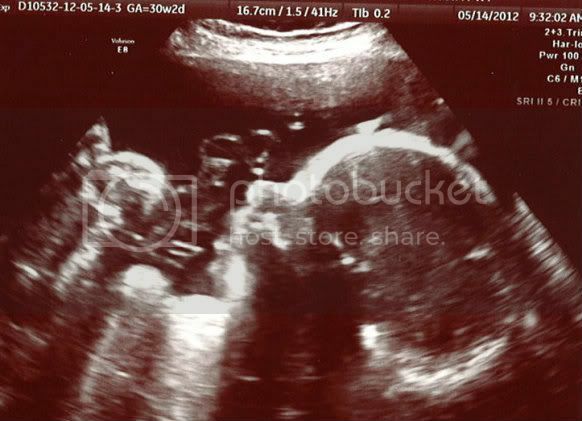 What I look forward to: My next ultrasound, so I can see how he has grown! My shower, which will be June 16. Moods: Pretty good! I've been a little snappy with poor Bunny, but I've been mostly in a good mood. Milestones: I reached the 3rd trimester last week! He's also now considered "viable" though would still be very premature if he was born now. Medical concerns: I'll have an ultrasound May 14 to see if the placenta has moved away from the cervix, hopefully it has. I passed the gestational diabetes test, so we're all good there! Misc: Lots going on since the last post. We moved to a new home last week! It was a lot of work but we're making good progress every day in unpacking. It is a beautiful home and we're very happy there. Now we just need to sell our place! Our nursery is totally empty, as we still have no furniture. I have the glider and crib on the registry, we'll probably buy just the dresser ourselves. We still don't have much baby stuff, because we're expecting to get a ton of stuff at the shower. I still don't feel like this is really real - I probably won't until after he is born. Thanks for hanging in there with me!